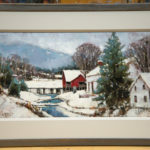 As a way to say thanks for your continued support, each month a draw two random Day in Vermont subscribers to win a free print of their choice. Thanks very much for all your support Michelle! Another beauty…I especially love that evergreen tree! This is an absolute beautiful piece! i mean ABSOLUTE!!!! piece of art, Peter, i’ve not seen one so lovely as this one. All paintings can hit us differently, mean more to us than others, but this one has really hit my core! Thank you for all your Inspirations! Please indicate if the bidding price is for originals and if in Ca dollars. Yes Joan, the auction/bidding is for the one and only original painting. In this case, 10X20 oil on linen panel. The bidding is in US dollars. Just let me know if you have nay other questions. Tx! Hi Peter, a great painting again. And winter lasts on and on. But you’re a fan of winter. Perhaps it’s the only way to stand it. You’re showing he positive sides of a the winter. The delicate white snow with its fine and specific colors. The ensemble of the mill and the amazing old conifer in the foreground. The point of view makes the difference: A painter instinctively catches the best, the most interesting perspectives. Go on. 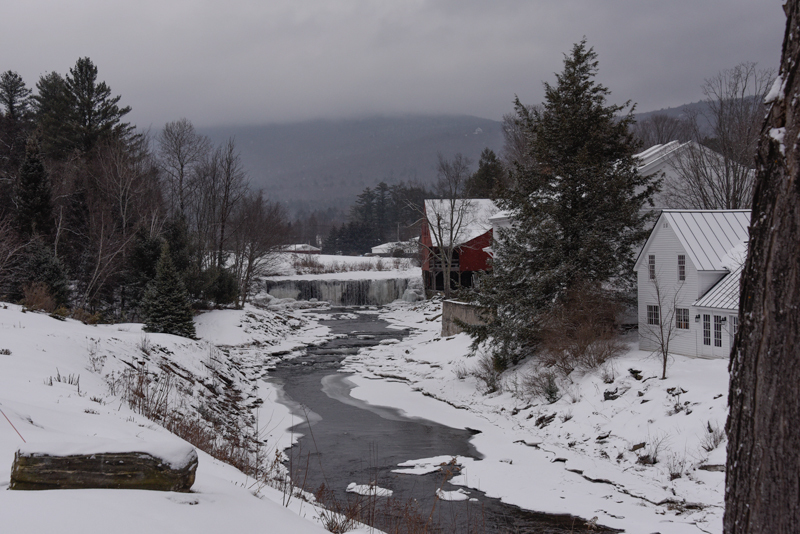 Every Monday we look into another great part of Vermont. Unique features; all of nature captured beautifully. Lots of history maintained in Vermont towns. Thank you for your continued art. 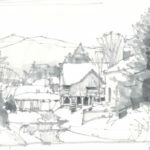 Hope others took the time to admire the preliminary sketch as well as the finished painting. It provides interesting insight into the thought process involved in developing line, texture and color values into a cohesive and captivating final work. I too like the foreground conifer, a blue spruce, perhaps? 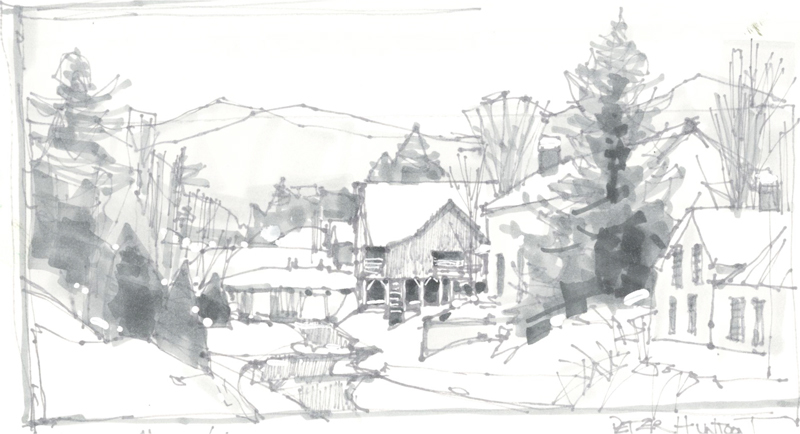 Thanks Brian, I have been emphasizing my preliminary sketches a bit more these days…I think they are contributing to the eventual painting, as well as my overall productivity, in a very positive way. Today I received my first “A Day in Vermont” email since T.M. Moore introduced me to you in his Feb16 ReVision commentary “Unity in Culture.” After thoroughly romping through all the images on your website, Peter, I have this question: WHEN DO YOU SLEEP?! Thanks Peter, as mentioned above, I do now paint full time, and I have been doing this a long while. I like to think I’m just getting started! 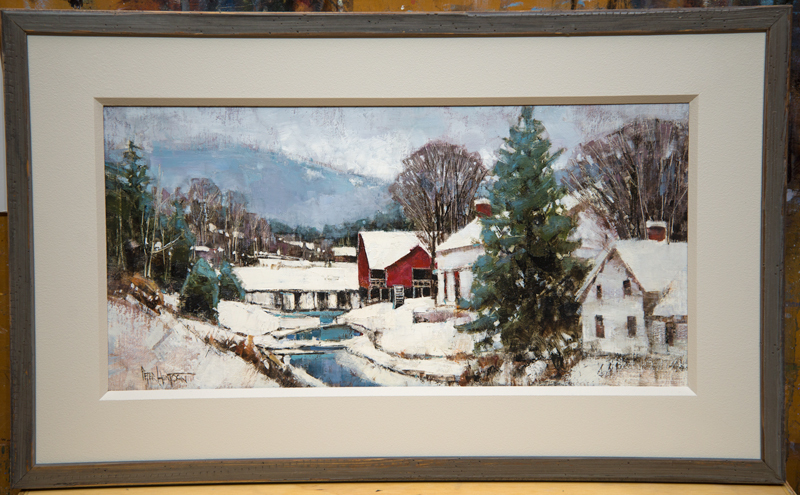 Your paintings bring back memories of my visits to Vermont years ago. It’s so lovely in the summer, everything is so green and peaceful. I also was there one Fall and saw so many colorful trees, it was breathtaking. Have you ever made a calendar of your paintings? 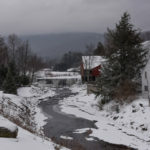 It would be lovely to see Vermont all year long. Thanks Lillian! I’ve batted around the calendar idea. I won’t rule one out someday. Love it! One of my favorites of all your works! My best friend and I spend time in Vermont every summer.. Weston,. Chester, Grafton, Bennington, Manchester. I have a feeling you are going to open up more places for us to see !!. Where can I buy your prints ? beauty…I love the red contrast with white snow scene.